Yaakov (James), a servant of Elohim and of the Master YESHUA Messiah, to the twelve tribes who are in the dispersion: Greetings. My brothers, count it all joy when you fall into various trials, knowing that the proving of your belief works endurance. And let endurance have a perfect work, so that you be perfect and complete, lacking in naught. If any of you lacks wisdom, let him ask of Elohim, who gives to all generously and without reproach, and it shall be given to him. But he should ask in belief, not doubting, for he who doubts is like a wave of the sea driven and tossed by the wind. For that man should not think that he shall receive whatever from the Master – he is a double-minded man, unstable in all his ways. And let the lowly brother boast in his exaltation, but the rich in his humiliation, because as a flower of the field he shall pass away. For the sun rose with burning heat, and withered the grass, and its flower fell, and its pretty appearance perished. So also the rich man shall fade away in his ways. Blessed is the man who does endure trial, for when he has been proved, he shall receive the crown of life which the Master has promised to those who love Him. Let no one say when he is enticed, “I am enticed by Elohim,” for Elohim is not enticed by evil matters, and He entices no one. But each one is enticed when he is drawn away by his own desires and trapped. Then, when desire has conceived, it gives birth to sin. And sin, when it has been accomplished, brings forth death. Do not go astray, my beloved brothers. Every good gift and every perfect gift is from above, coming down from the Father of lights, with whom there is no change, nor shadow of turning. Having purposed it, He brought us forth by the Word of truth, for us to be a kind of first-fruits of His creatures. They are watching us with the same expectation which they experienced in their lifetime. Even now they are desiring and spurring for us to finish this “Faith Race” in His Strength. The Lord always remains Faithful and True causing us to triumph. But as in every race or journey of life there are tests and trials we need to face. Our Lord tells us we need to count the costs. Yes! Salvation is free, Christ Jesus paid the price for our Salvation! He became our Sacrificial Lamb! He is the Lamb of God; who takes away the sins of the world (see Jn 1:29). He suffered much, yet He is God in Flesh. Christ Jesus often let His disciples know of the price which He was to pay for the Salvation of the world. 14 But thanks be to God, Who in Christ always leads us in triumph [as trophies of Christ’s victory] and through us spreads and makes evident the fragrance of the knowledge of God everywhere,15 For we are the sweet fragrance of Christ [which exhales] unto God, [discernible alike] among those who are being saved and among those who are perishing:16 To the latter it is an aroma [wafted] from death to death [a fatal odour, the smell of doom]; to the former it is an aroma from life to life [a vital fragrance, living and fresh]. And who is qualified (fit and sufficient) for these things? [Who is able for such a ministry? We? ]17 For we are not, like so many, [like hucksters making a trade of] peddling God’s Word [short changing and adulterating the divine message]; but like [men] of sincerity and the purest motive, as [commissioned and sent] by God, we speak [His message] in Christ (the Messiah), in the [very] sight and presence of God. (See 2Cor 2:14-17 AMPC). Paul had also experienced, paid the price for the spreading of the Good News of the Gospel of God’s Kingdom. Jesus (Yeshua) is our King, if and when we relate to Him, we become His subjects who make up His Kingdom. When Pilot asked our Lord (Christ Jesus); are You then a King? Christ Jesus answered and confirmed He is a King, but His Kingdom is not of this world. We are also aware of this one fact; “all of Creation is awaiting the revealing of the sons (children) of God” (see Rom 8:14-23). Now therefore if we are saved through the death of One, through our receiving of the same One we shall live. He is the Giver of Life! He is the Way, the Truth, and the Life! He is our only Mediator between God and man! No man is able to come to the Father, except through our acceptance of Christ Jesus as Lord and Saviour of our lives. Our Lord tells us, those who accepted, received Him would also receive us. He forewarned us there would also be those who, would not receive Him neither would they receive us. Nevertheless though these heroes of faith as recorded in Hebrews, are known for their faith, they were also tried and tested for their faith. While reading Hebrews 11:1 to the end of that chapter we come across their different tests and trials. Some were victorious, overcoming great odds, tests or trials; Others were tortured, Killed, stoned, sawn in two cast away from their people, made mockery of and so forth (see Heb 11:23-25; 32-40). Paul after his Damascus encounter which he had with the Lord, was informed of the price which he had to pay for following Christ. We see his testimony throughout the latter part of Acts. He writes of a thorn in his flesh, a messenger of Satan to buffet him, which would keep him from being full of pride. For the Lord revealed Himself to Paul, showing him a manifold of revelation. He was taken up to heaven and saw wondrous things, too many for a man to mention. He says eye hath not seen nor ear heard or mouth uttered, the great wondrous things prepared through our Lord which are saved up for the elect (see 1 Cor 2:9; 2 Cor 12:2-10). He further relates to us the reason for this thorn which he received in the flesh. When asking the Lord to remove the thorn from him; our Lord tells him; – “My Grace is sufficient for you, for My strength is made perfect in weakness.” For this reason Paul writes further that he would rather, gladly boast in his infirmities, that the power of Christ may rest upon him. Because of these tests and trials he underwent; Paul, could say he would rather take pleasure, in infirmities, reproaches, needs, persecutions, distresses for Christ’s sake. For when he is weak the Lord strengthened him. Interesting fact though, is all the apostles, whom were raised up and called by our Lord, suffered death, persecution and/or banishment, from the society of their day. Our Lord warned them to count the cost. Remember when following our Lord; although Christ died in our place for the sin of man, there is still a price to be paid! Even the Old Testament saints, kings and prophets, experienced testing and trial of their Faith. We read of Noah, Abraham, Isaac and Jacob all whom were sought out by God. The Lord knew their hearts. He prepared them for their specific tasks and mandates which He had for them. He also prepared them to stand strong in the time of the storms they would face. Now if they (including David) fought battles and were victorious, the Lord causing them to triumph! How much more so, even we who in this present day and age are alive living for God shall also undergo diverse tests and trials. 6 In this you greatly rejoice, though now for a little while, if need be, you have been grieved by various trials, 7 that the genuineness of your faith, being much more precious than gold that perishes, though it is tested by fire, may be found to praise, honour, and glory at the revelation of Jesus Christ, 8 whom having not seen[a] you love. Though now you do not see Him, yet believing, you rejoice with joy inexpressible and full of glory, 9 receiving the end of your faith—the salvation of your souls. (See 1Pet 1:6-9 NKJ). James also writes about tests and trials we would face. In fact he is so bold as to say we are to count it all joy when we fall into diverse tests and trials. The reason which he gives is the testing of our Faith produces patience. Then patience will have her perfect work, for us to be complete and perfect, lacking nothing (see Jas 1:1-13). Remember gold though a precious metal, needs to be placed in a furnace, to produce its high grade of purity. Once it is being purified it increases in value. Also diamonds undergo much pressure, before they can be crafted into valuable pieces of jewellery. Even silver, a semi-precious metal is tried by fire thus making it sterling silver. So then we also shall face differing tests and trials in our life, so that which is pure shall remain. Are we willing and ready to face them? For it is written whoever desires to live Godly and righteously, shall suffer persecution. Are we willing to follow the Lamb of God? He is the Lion of Judah! He is both the Lamb of God who takes away the sin of man and the Lion of Judah, rules and reigns from Eternity to Eternity. 4 And I wept audibly and bitterly because no one was found fit to open the scroll or to inspect it.5 Then one of the elders [[a]of the heavenly Sanhedrin] said to me, Stop weeping! 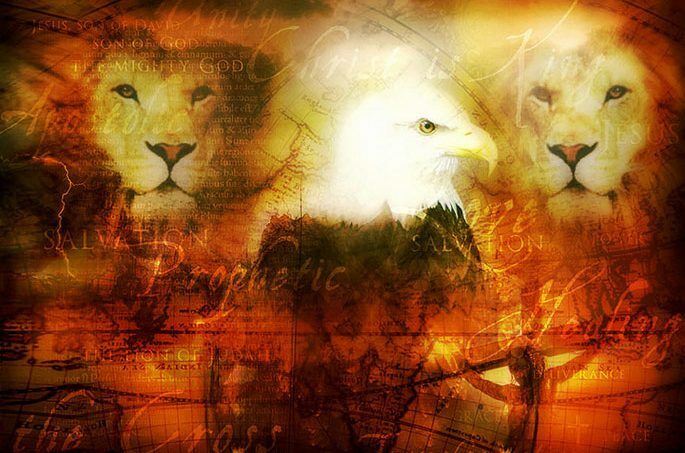 See, the Lion of the tribe of Judah, the Root (Source) of David, has won (has overcome and conquered)! He can open the scroll and break its seven seals! 6 And there between the throne and the four living creatures (beings) and among the elders [[b]of the heavenly Sanhedrin] I saw a Lamb standing, as though it had been slain, with seven horns and with seven eyes, which are the seven Spirits of God [[c]the sevenfold Holy Spirit] Who have been sent [on duty far and wide] into all the earth. (Rev 5:4-6 AMPC). 13 “When Ephraim saw his sickness, and Judah saw his wound, then went Ephraim to the Assyrian, and sent to King Jareb. Yet could he not heal you, nor cure you of your wound.14 For I will be unto Ephraim as a lion, and as a young lion to the house of Judah; I, even I, will tear and go away; I will take away, and none shall rescue him.15 I will go and return to My place, till they acknowledge their offense and seek My face; in their affliction they will seek Me early.” (Hos 5:13-15 KJ21). 8 Judah, you are the one whom your brothers shall praise; your hand shall be on the neck of your enemies; your father’s sons shall bow down to you.9 Judah, a lion’s cub! With the prey, my son, you have gone high up [the mountain]. He stooped down, he crouched like a lion, and like a lioness—who dares provoke and rouse him?10 The sceptre or leadership shall not depart from Judah, nor the ruler’s staff from between his feet, until Shiloh [the Messiah, the Peaceful One] comes to Whom it belongs, and to Him shall be the obedience of the people.11 Binding His foal to the vine and His donkey’s colt to the choice vine, He washes His garments in wine and His clothes in the blood of grapes.12 His eyes are darker and more sparkling than wine, and His teeth whiter than milk. (Gen 49:8-12 AMPC). Paul also writes of all his tests, trials, and tribulations in much of his letters. Saying how much he had to suffer, for the Gospel of God’s Kingdom! 10 But you have carefully followed my doctrine, manner of life, purpose, faith, longsuffering, love, perseverance, 11 persecutions, afflictions, which happened to me at Antioch, at Iconium, at Lystra—what persecutions I endured. And out of them all the Lord delivered me. 12 Yes, and all who desire to live godly in Christ Jesus will suffer persecution. 13 But evil men and impostors will grow worse and worse, deceiving and being deceived. 14 But you must continue in the things which you have learned and been assured of, knowing from whom you have learned them, 15 and that from childhood you have known the Holy Scriptures, which are able to make you wise for salvation through faith which is in Christ Jesus. (2Tim 3:10-15NKJ). So let us bear in mind, to serve the Lord full out has both pros and cons. The benefit is we can have life, and life more abundantly. Yet we are reminded through our Lord, to count the cost of following Him. There is a definite price which we are to pay, for the Gospel. The Kingdom of God is established through the price which Christ Jesus has paid for our Salvation. We are reminded no builder, business would buy property then lay the foundation for a great building or tower, without first counting the cost. Should he buy without proper planning, he may build halfway run short of funding before completion and become the centre of communal jesting. The people could question the value of his integrity and or the validity of his testimony. Neither would a king go to war if he has not first counted the cost of the battle, he is about to face. In fact no champion sportsman/woman worth their salt, would face their opposition without first preparing for their next heat which they are to face. When push comes to shove, we need to be sure whether we might have to pay with our life, for the freedom of serving the Lord our God. For they overcame the enemy by the Blood of the Lamb and the Word of their Testimony, and they did not love their lives to the death (see Rev 12:11). Although the cost of discipleship is high, the reward is great. Our Lord sets before us the choice of life or death, blessing or cursing! Even so we still need to choose life! “For this command which I am commanding you today, it is not too hard for you, nor is it far off. “It is not in the heavens, to say, ‘Who shall ascend into the heavens for us, and bring it to us, and cause us to hear it, so that we do it?’ “Nor is it beyond the sea, to say, ‘Who shall go over the sea for us, and bring it to us, and cause us to hear it, so that we do it?’ “For the Word is very near you, in your mouth and in your heart – to do it. “See, I have set before you today life and good, and death and evil, in that I am commanding you today to love YHVH your Elohim, to walk in His ways, and to guard His commands, and His laws, and His right-rulings. And you shall live and increase, and YHVH your Elohim shall bless you in the land which you go to possess. “But if your heart turns away, and you do not obey, and shall be drawn away, and shall bow down to other mighty ones and serve them, “I have declared to you today that you shall certainly perish, you shall not prolong your days in the land which you are passing over the Yarden to enter and possess. “I have called the heavens and the earth as witnesses today against you: I have set before you life and death, the blessing and the curse. Therefore you shall choose life, so that you live, both you and your seed, to love YHVH your Elohim, to obey His voice, and to cling to Him – for He is your life and the length of your days – to dwell in the land which YHVH swore to your fathers, to Avraham, to Yitsaaq, and to Yaaqov, to give them.” (Deu 30:11-20 TS2009). 11 “For this commandment which I command you today is not too mysterious for you, nor is it far off. 12 It is not in heaven, that you should say, ‘Who will ascend into heaven for us and bring it to us, that we may hear it and do it?’ 13 Nor is it beyond the sea, that you should say, ‘Who will go over the sea for us and bring it to us that we may hear it and do it?’ 14 But the word is very near you, in your mouth and in your heart, that you may do it.15 “See, I have set before you today life and good, death and evil, 16 in that I command you today to love the Lord your God, to walk in His ways, and to keep His commandments, His statutes, and His judgments, that you may live and multiply; and the Lord your God will bless you in the land which you go to possess. 17 But if your heart turns away so that you do not hear, and are drawn away, and worship other gods and serve them, 18 I announce to you today that you shall surely perish; you shall not prolong your days in the land which you cross over the Jordan to go in and possess. 19 I call heaven and earth as witnesses today against you, that I have set before you life and death, blessing and cursing; therefore choose life, that both you and your descendants may live; 20 that you may love the Lord your God, that you may obey His voice, and that you may cling to Him, for He is your life and the length of your days; and that you may dwell in the land which the Lord swore to your fathers, to Abraham, Isaac, and Jacob, to give them.” (Deut30:11-20 NKJ).